A children’s author dazzles with imaginative storytelling and humor that will surely entertain and make readers laugh throughout the series. “The Helium Egg” (PRGott Books Publishing; 2010) is the second book in The Helium Books series, which introduces a science topic, namely helium. This children’s book marks the second collaboration of E. Dorinda Shelley as a children’s writer and for Eleanor A. Hutton as a children’s book illustrator. “The Helium Egg” takes place in a barn owned by the family of a young girl named Kath. A little black hen finds a soft large blue egg, which rapidly expands and starts to float like a helium balloon. All the barnyard animals – ducks, geese, sheep, donkeys, cats, dogs, and even the peacocks – sit on the egg to weight it down and keep it inside the barn. What hatches is a surprise to the animals, most especially to the little black hen, who becomes an unexpected mother to a different kind of children. Why does the mysterious egg float and what hatches out of it? Readers will be in a shock when they read E. Dorinda Shelley’s “The Helium Egg.” Order a copy today through Amazon (https://www.amazon.com/gp/product/057805504X) and Barnes & Noble (https://www.barnesandnoble.com/w/the-helium-egg-eleanor-a-hutton/1124597710). 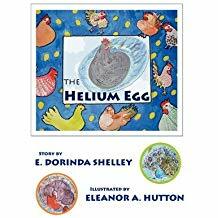 Watch for the public display of all the titles in E. Dorinda Shelley’s The Helium Books series: “The Helium Table,” “The Helium Egg,” and “Helium Heels” - at the upcoming 2019 London Book Fair New Title Showcase on Mar 12-14, 2019. Dr. Shelley is a retired dermatologist. She grew up in Missouri, spending weekends on a farm with friendly horses. She, her husband, and three children lived for many years on a “farmette” in NW Ohio, surrounded by many of the animals in the Helium Books. This is the first in a series of books she has written and Eleanor Hutton has illustrated.